Think of a crumble and most people would conjure images of a piping hot fruity creation but, oh no, not this one! This butter bean, butternut squash and chorizo crumble gives a range of textures and flavours that you will cook again and again. I have given this a Spanish twist to enhance the flavours from the chorizo which marries beautifully with the gentle sweetness of the squash and the creamy beans. You could also add chicken if you wanted an even heartier dish or leave out the chorizo and add in some other vegetables to make it vegetarian. Supermarkets are becoming quite handy in helping out with shortcuts too so if, like me, you can’t stand having to cut a solid butternut squash you can buy ready peeled squash which is great to have when time is short. 1. To get started add a splash of oil to a large pan and gently sweat the onions and garlic. You are looking for gorgeously softened onions which are beginning to get a little colour. Pop in the spices, chilli (if using) and chorizo and cook out for a further couple of minutes so they release their flavour and the chorizo begins to colour. The chorizo enhance the smoked paprika even more! 2. I then add the cubes of butternut squash and red pepper. Stir well so they get a spicy coating and cook for a few minutes. Pop in the butter beans and, again, stir through. Next goes the passata and stock, season and bring the pan to a simmer, cover and leave for 15 minutes before then removing the lid and simmering for a further 15 minutes. If you have left your chunks of squash a little larger then 20 minutes followed by another 20 minutes may be needed but give it a check as you go. 3. Whilst that is cooking away and then sauce is starting to reduce you can make the crumble topping. I have kept this as simple as possible but you could substitute it with a breadcrumb topping if you prefer. Simply take the softened butter and add to a bowl with the flour and rub between your fingers; this will form a crumb. Season and add some grated manchego cheese if you like. 4. When the passata and stock has reduced down spoon the mixture into either one large ovenproof baking dish or individual ones if you prefer. If you are a cheese fan then you could always add small chunks of any leftover manchego cheese to the mixture so this will melt as it bakes. Sprinkle over the crumble topping and bake at 200c/ 180fan for around 20- 30 minutes until the topping is golden. Serve with crusty bread or a simple side salad. 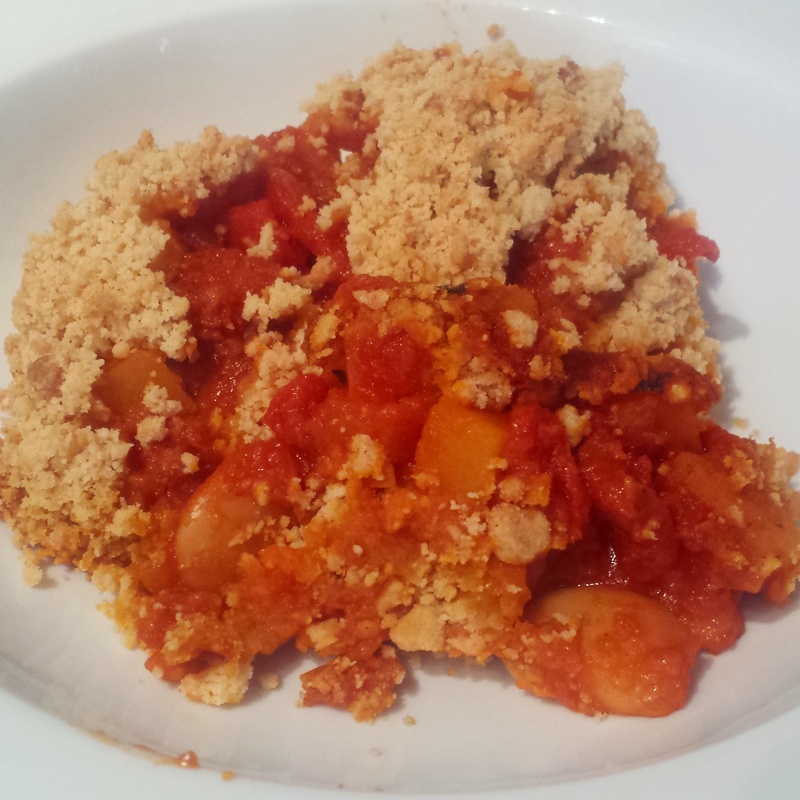 Butter bean, squash and chorizo crumble- a vibrant dish to brighten up any day! P.S. If, like me, you made too much the leftovers as just as delicous! 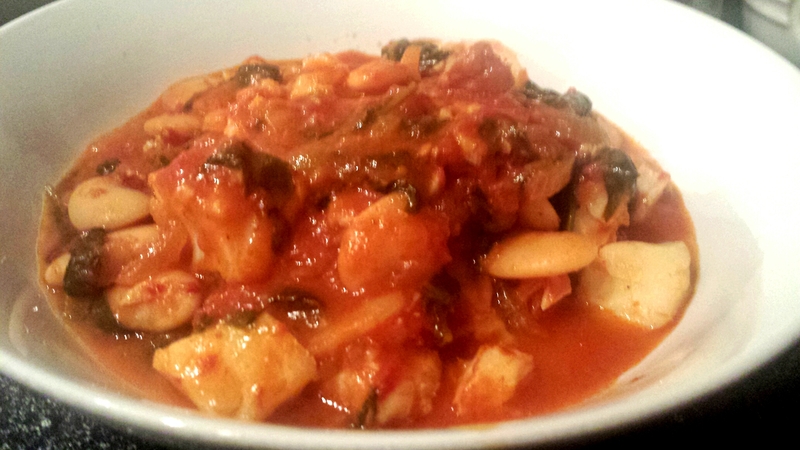 I added spinach and cooked it so it wilted and served it with pan fried white fish for a variation.